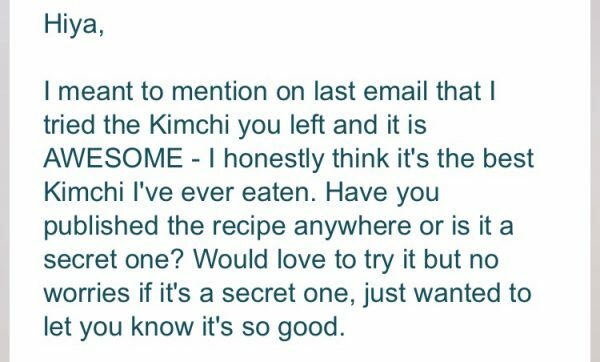 This recipe was inspired by a lady called Freddie Janssen, who is famous for her blue cheese and kimchi sandwiches. Well, I love my (raw vegan) cheese, so I was all over that idea. 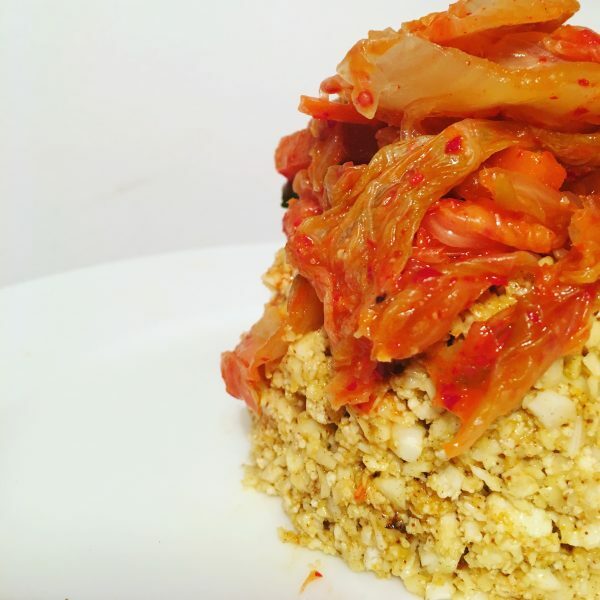 I was already obsessed kimchi, but this recipe takes it to a whole new level. The addition of some fat in the form of sesame oil makes it even more umami. I’ve been making kimchi sandwiches, kimchi wraps, and best of all, kimchi sushi. Prepare the brine by boiling 2 litres water. Pour into a large bowl and add 2 tbsp salt, and 1 tbsp coconut sugar. Leave to cool. Once it’s cooled, chop your Chinese cabbage, daikon and carrots, and put them in the brine. Slice your carrots and daikon into rounds, as thin as you can. Reserve an outer leaf from the Chinese cabbage, and quarter it lengthways, and then cut those quarters into chunks about 1/2 cm thick. I like it quite chunky. Reserve the stem for later use. Once they are in the brine, place a plate on top to cover, and something heavy to keep the plate weighted down and the veg submerged in the brine. Leave for around 12hrs. To make the paste, in a small bowl, mix up the chilli flakes, tamari, sesame oil, kelp powder and coconut sugar. Mince the ginger and garlic and stir those in. At the same time, sterilize your Kilner jar by pouring boiling water over it. Drain the brine off the veggies, reserving a little in case you need it later. Using plastic gloves, massage the paste into the veg, along with the sesame seeds. Once it’s thoroughly mixed, press it into your Kilner jar. Be sure to pack it down so there are no air bubbles left, and the veg is submerged in the juice. If it’s not quite submerged you can add a little extra brine. Cover with the leaf you saved at the beginning, and use the stem as a stopper to keep the veg submerged. Clip the lid down and leave for at least a week for the flavours to develop. Once opened, store in the fridge, will keep indefinitely.